Forever Blog— FOREVER FIT: Get Your Memories in Shape! In order to create healthy habits, it’s always a good idea to reinforce a routine. So, starting tomorrow morning, we’ll be completing the SAME 5 steps to getting your memories in shape as last week! Whether you’ve been actively participating and are feeling good about your organization or you want to hop on the bandwagon, NOW is the time to become FOREVER FIT! Next, our focus is ALBUMS! Now that you've uploaded files to your FOREVER Account, it's time to choose which photos, videos, and documents to keep. It's easy to delete, recover, and organize your files into albums (especially using the steps below)! Sharing your memories with friends & family is fun and easy. We'll show you several methods of quick and easy SHARING! After all, why save and record your memories if not to enjoy them with loved ones? Creating PRINTED PROJECTS is fun and easy! Whether you choose to make a project in minutes with FOREVER Print or customize every aspect of your design with FOREVER Artisan, you'll love the result! So are YOU ready to join the movement toward FOREVER Fitness? Imagine how great it will feel to know that all your most important memories are safe, organized, and able to be shared and enjoyed for years to come. The actions that you take now will benefit future generations! And we’re here to help! 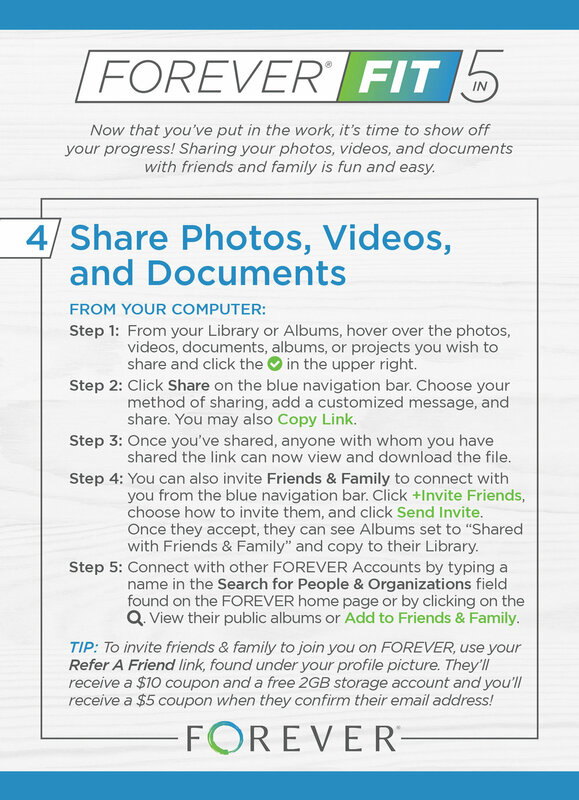 Tune into facebook.com/forever every weekday at 11am ET for tips, tricks, and support getting your memories in shape. We encourage you to ask questions in the comments and bring your workout buddies along for the ride (after all, no one likes working out alone!) And you can check out ALL of our FOREVER Fit resources and materials here! We’re in this together!